Walking into the Jerwood Foreshore Gallery there is an art work exploding out of the wall, stopping HOT’s Lauris Morgan-Griffiths in her tracks. It is the work of artist Gus Cummins. 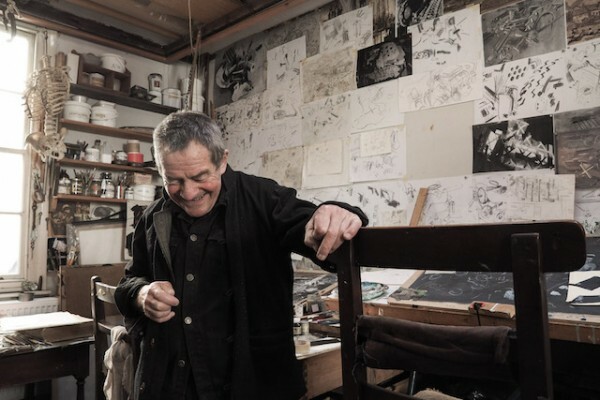 An inhabitant of Hastings for the past forty years; a Royal Academician and an artist who happens to be local – distinct from a local artist. Hastings people are delighted to see Cummins at the Jerwood. His work is well known around the town, but it is refreshing to see the breadth of his art in a one-man show. I have to admit that because Cummins was part of the surrealist show at the Hastings Arts Forum, I had put him in the surrealist bracket. Wrong. However, past Royal Academy President, Sir Roger de Grey, did slot Cummins between the thinking of the surrealists and the expertise of the magic realist paintings. “He has created a unique situation for himself by his absorption with a space between a compilation of ordinary objects which are transformed by him into some magical unexplored world, where only he can reveal to us the nature of things… To enter this world is to join him in a voyage of discovery in which unexpectedly you find yourself in the central role.” A very lyrical description of Cummins’ work. 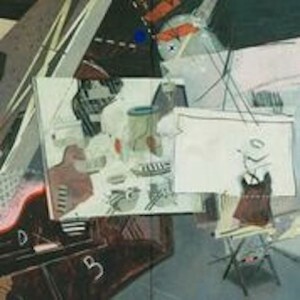 To begin with it is confusing but entrancing to notice all the different elements and objects he includes in a painting. I had to suspend logic and enter into Cummins’ biosphere, a space that appears to defy reason. Artists describe their particular canvas worlds in their own idiosyncratic ways. Cummins world appears one of story telling, where he develops the plot as he explores his many interests. He spins his stories through artefacts and interests that he knows intimately and has collected and sought out over the years; from a scaled down ship, to an old drum, old hats, plum lines, taxidermy, cogs and pipes, engines, machines, industrial objects, tools, family history and memories and his interest in the second world war. All sorts of oddities which Cummins evidently holds in high regard as he draws you into his world. It feels as if these objects are his friends – although inanimate (there are few shadows in the paintings – and seldom people) he has animated them; given them characters. It’s possible that by giving them different juxtapositions he is feeling his way into different perspectives of their character. His studio is apparently a treasure trove of objects trouvé, bought at auction, or ferretted out of a local shop over the years; all waiting in the wings for him to find their perfect spot in one of his paintings. Besides Cummins work, he has curated a selection of Hastings artists: Charlotte Snook, Angie Braven, Nicholas Pace, Batthew Buttows and Gerard Hemsworth. And a new series of Quentin Blake’s artwork, the idiosyncratic Moonlight Travellers.